A Code Kata is a quick programming challenge where you try and solve a problem. The goal is to become a better programmer by taking one quick challenges that are different than the stuff you code everyday. You take a problem and you only get 30 minutes to work on it. The idea is that you activate your brain while learning new skills. It is good to work on a code kata first thing in the day then start your normal work (I never do, but that is the idea). 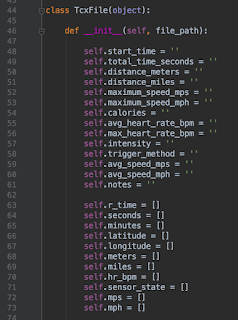 This code kata is taking my heart rate history and comparing two runs to see just how bad my heart rate has become. This involved building a POSTGRES database, parsing and saving TCX files to the tables, pulling in the data and plotting in Matplotlib using Pandas. I was running consistent exercises up to early February. On Feb 11th I did a heart rate test run. On the treadmill I ran 6.2 mph for 3 miles. The idea is that if I run the same speed and measure my heart rate at a different time in the year I can see if my aerobic fitness has improved or not. Well, then I didn't run for a month and a half. Not trying to kill myself, but life happens. So I took the opportunity to test my heart health again and see the differences. All for science. If you keep reading you will get some code samples. I will eventually publish my code on Github after I polish it up a bit first. There are just samples to how I performed different code snippets. The same treadmill and heart rate monitor were used on both runs; Polar H10 which connects to my iPhone via bluetooth. 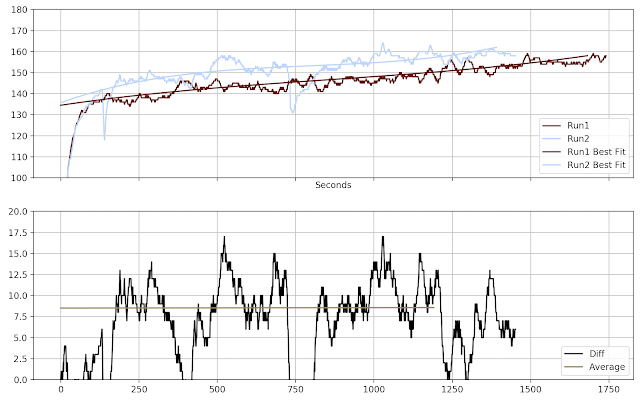 Sessions are uploaded via the Polar Beat app and I can download a TCX file with details; Time, heart rate, latitude and longitude. Polar's website and app are sufficient and give some statistics. The problem is that you can't compare two sessions against each other. 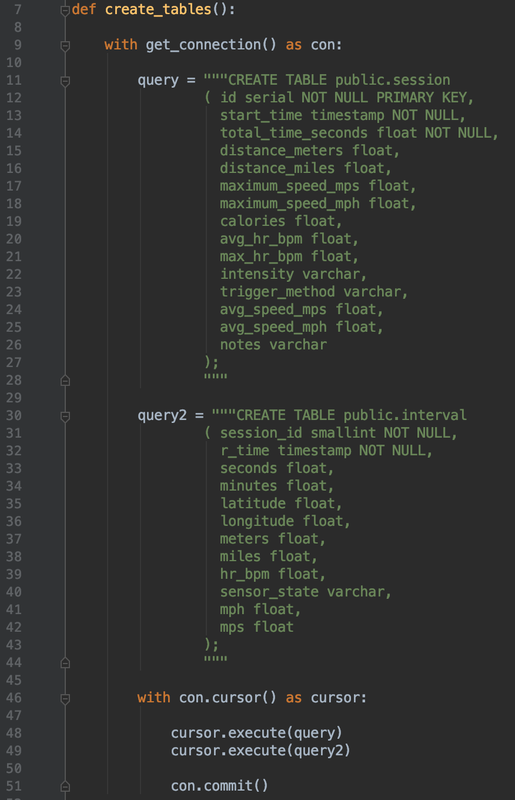 When I created the database I saved the table building queries inside of a method so I quickly quickly regenerate them in a new database. I have the details stored in an INTERVAL table and the general data stored in a SESSION table. Parsing the TCX file is the same as parsing an XML file. I could have used python's XML reader library but I split out the pieces myself and saved them to a few arrays before storing them to the database. 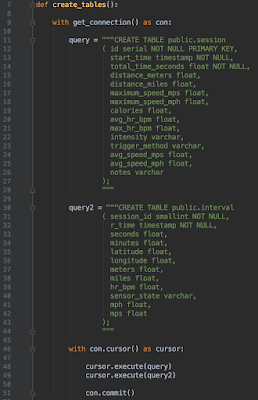 When I query for a run I get a Pandas DataFrame. Making the plots required calculating the number of seconds, adding some best fit lines and calculating the differences in heart rate between the two runs. 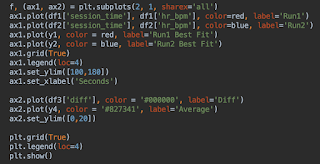 First I pull in the data into a DataFrame, split the sessions into two different DataFrames, and calculate seconds. 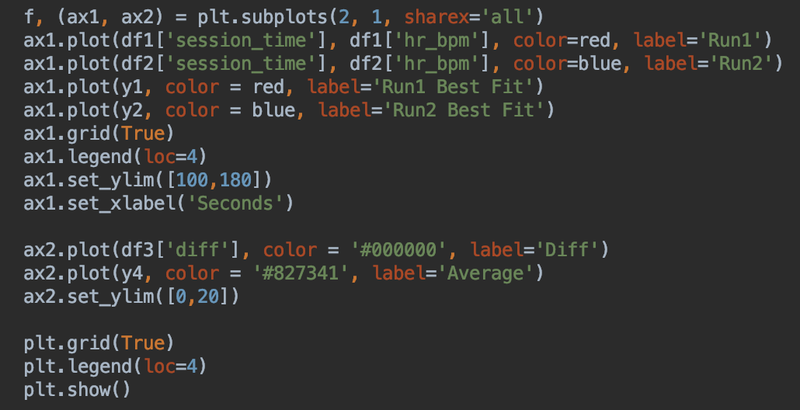 There is probably an easier way to calculate the best fit lines, I just did it quick and dirty using Numpy and running a 3rd degree polynomial. I did filter the data to start curve fitting after the first 60 seconds. 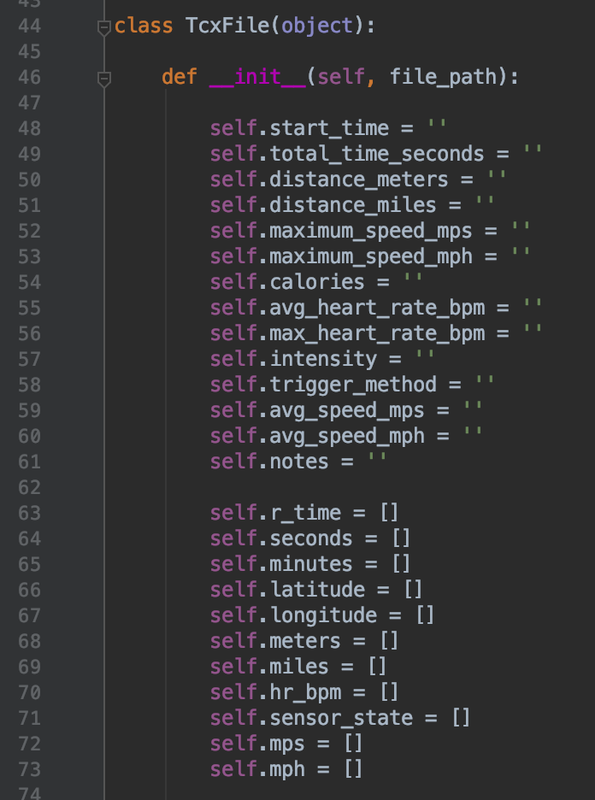 To calculate the differences in heart rates I merged the DataFrames back together using seconds as the joining column and made a quick calc. It is only a couple lines of code in Matplotlib to show all the data. What IDE uses these crazy colors? PyCharm from Jetbrains. I've really enjoyed using Visual Studio Code but I have one issue where VS Code doesn't always find unit tests in python.